With EXISTENTIALISM on one hand and MINIMALISM on the other, my vagrant mind weaves stories every moment, just every moment. Coupled with this, I have an insanely bad habit of binge reading and collecting books. Kindle is non existent for me unless my need to read overpowers my need to hold pages in my hand. An ardent lover of plants and sunsets, I also specialize in reading people's mind without their permission. All this is possible by regular dose of Lemongrass and Basil tea. A Life Coach, a writer and an educator- I am Namrata Singh and Four Clover Life is my brand--------------------http://www.fourcloverlife.com/. 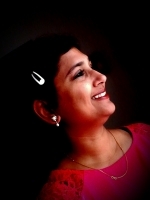 I am a contributing author/essayist/columnist/Storyteller to some of India's leading online platform--------Women's Web, Readomania, MyCity4Kids, BlogAdda and contribute extensively to various parenting forums.I am currently putting final touches to my maiden novel which shall be published soon. Come on in!!! Namrata- A Logophile, A Bibliophile sondering through life. Great Job, Great Position, Great Salary… What More Do You Want From Life?! A mother writes a letter to a teen son who has just experienced heartbreak - it seems like the end of the world. But is it? Asks this mom who talks of her teenage heartbreak.